Twin and triplet kids are rarely “identical:” the two roans are from different dams, and the roan buck’s twin (not shown) is black & white. The ice goes back to the house and on the woodstove. Too many merciless dry Summers have passed, to bear the thought of dumping gallons of water on the ground. Now you know about “Ice.” “Pine” has come to mean a real blessing, as well as a lesson in land management. The furthest hayfield, 5 acres, was always poor, hardly worth baling, steep, so in rainy years the lime soil leaches heavily, and pitched away from sun. So in 1990, when we took up the Forestry Division’s offer of 100 white pine seedlings at nominal cost, it was in hopes of finding a better use for that land. A number of trees have been lost since then – poor land is poor land – but most have thrived, and some are impressive, 30’ high and a foot thru the trunk. Since 2001 when I started Winter market (with 3 other brave souls in the Farm Shed, Dennis of Backyard Orchard, Charles of Moore Farms and Steve & Linda of Linda’s Luxuries), I’ve set out buckets of pine branches, and added them to wreaths of juniper, boxwood and blue spruce. 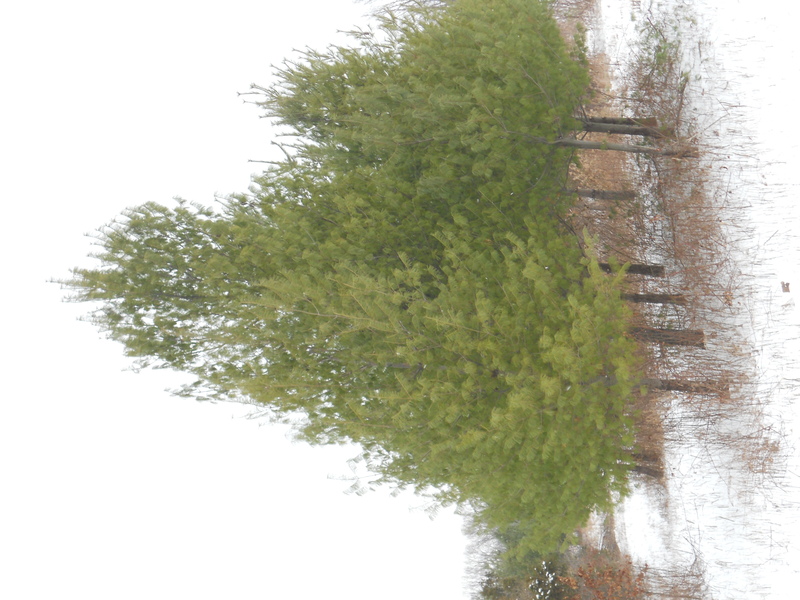 Checking into proper pruning, I learned that altho white pine may self-prune (i.e. shed lower branches), they should be limbed about every two years. So pruning for Holiday greenery got methodical: any tree I cut from was clipped of dead branches, and live ones up to the lowest complete tier of healthy limbs. But 4 or 5 trips to the Pine Lot in November/December were not enough to manage the whole field properly. Then came goats, then the winter of 2009, when snow covered the ground for weeks on end. Pine, and the native juniper (“Eastern Red Cedar”) are green thru Winter, and high in Vitamin C. The does, eager for anything green since early cold snaps have killed off the honeysuckle, go thru a trailerload of pine or juniper like piranhas. Once the needles are gone, they strip the bark, trees’ transport system, full of sugar and minerals. Snow stayed around from Thanksgiving thru New Years: we’ve gone thru the hay that would normally last all Winter. So every other day there’s a trip to the Pine Lot. This morning two of the does were off their feed. Nightshade took a quart of tonic, but Trill didn’t even want that. Then I noticed her nibbling a few remaining needles from Friday’s cutting of pine. If pine was what she relished, pine was what she’d have. On a 23-degree day, if you have to be outside, be grateful for sun, and light wind. By the time I got to the Pine Lot, I had shed muffler and heavy gloves. Half an hour’s cutting was enough for two more days’ browsing, and when I piled bundles of branches into the does’ pen, both Nights and Trill fell upon it along with the others. An animal that’s relishing its feed is probably going to be all right. By today, Wednesday, the list has been swapped around pretty good. I’ll go to Mom’s tomorrow, after making sure all day today that there’s enough water in reserve for horses and goats, all up in the barn after 4 new inches of snow. My trusty barn hand came Monday to beat the snowstorm, and besides 3 or 4 long neglected tasks of carpentry, and another trailerload of greenery, we got the kids weighed. 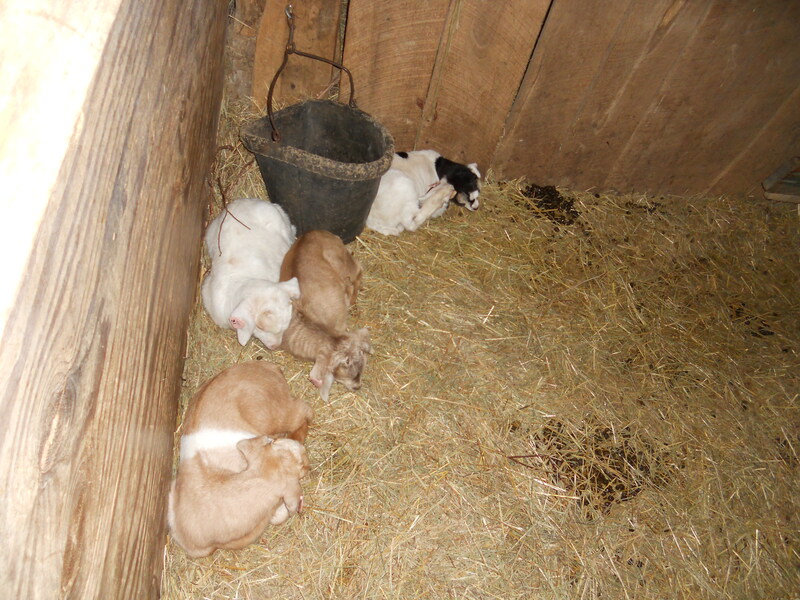 At 2 weeks old, the four largest are around 20 lbs, the other three from 11 to 17. Satisfactory! Here’s an image. Also look under Presents from God, for a couple images from Nature today. Ooops! “Nichols,” “Ronnigers,” TGS and VBS, on the envelope up there, are seed suppliers. As I’m getting my orders together, I will make sure their links are added at left, with my heartfelt recommendation of 4 long-trusted outfits. « Kidding 2011 – I.